Garrett Wade has paired its German mini hand drill and a 50-piece drill set to create a great combo for the hand tool enthusiast. The drill is a classic item that never goes out of style, particularly for small, quick jobs when you can simply go to work without having to charge up or find an extension cord. It has a 3-jaw single pinion movement with wood handles and an alloy driving wheel. It weighs 9-1/2 oz. and is only 9" long, with a 6mm chuck (so the bit shanks need to be less than ¼"). The bit set includes the most common drill bit sizes and provides multiple replacement copies of each in case one breaks, goes dull or gets lost. 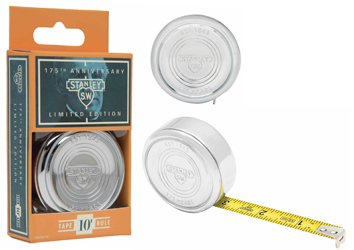 To commemorate its rich 175-year history, Stanley Tools has designed a limited-edition 175th Anniversary Tape Measure. It features a die-cast case with chrome finish, and a 10-foot blade that's long enough to measure standard sheets of plywood and drywall. This tape was inspired by the original design from 1933, with updated functionality for today's applications. For example, it has a spring-assisted blade return for quick retraction. The case features a vintage Stanley® SweetHeart™ logo. In 1843, Frederick Stanley started a small shop in New Britain, Connecticut, to manufacture bolts, hinges and other hardware. In 1910, Duncan Black and Alonzo Decker started their shop in Baltimore, Maryland, dedicated to manufacturing the world’s first portable power tool.The company, Stanley Black & Decker, is still located in New Britain. 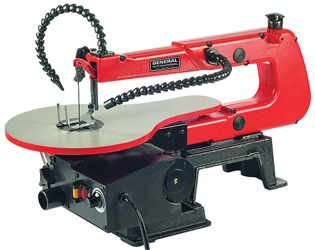 Woodworker.com has posted the TBT8007 16" variable speed scroll saw in its new products section. The saw is listed at $99.99 (on 12/29/18) and bears the General International logo. Featuring low noise and low vibration, its cutting speed can be adjusted with a precision dial on the front of the housing. There's a cast aluminum worktable with a locking knob and a bevel scale. The saw also includes a flex-neck LED work light, a patented blade holder that accepts standard 5" pin end or plain end blades, and a dust collection port for standard 1-1/4" hose. There's a side storage compartment for spare blades and wrenches, a top mounted tensioner knob and a safety on/off switch with a removable security key. The manufacturer (it's imported) offers a one year warranty. The motor is 120V, 60Hz, 1.2 Amps and runs at 400 to 1600 rpm. It's a 5/8" stroke and the throat depth is 16". The table tilts to 45 degrees, and the max thickness of work is 2". Shipping Weight is 26.5 lbs, and there's a dust blower. According to the Finnish company Mirka, it's new WPF Next Gen is "the ideal paper abrasive for effective hand sanding, both wet and dry, on multiple surfaces. It is very flexible, fully waterproof and has great grain adhesion." Produced with new coating technology, the abrasive surface doesn't clog up easily, and the company says that you can sand faster and the abrasive lasts longer. While it is especially recommended for automotive refinishing due to the consistent surface finish, it also has strong potential for final finishing on casework and furniture. The finer grits are optimal for fresh clear coats. The grain is aluminium oxide and the paper is a green/yellow color. It has B-paper backing (it's latex, and extremely flexible for curved surfaces), a resin over resin bond, semi-open coat and comes in a grit range from P60 to P2500. Mirka USA Inc. is located in Twinsburg, Ohio. Turners and furniture builders might welcome the news that Woodcraft has just received a shipment of spalted tamarind (tamarindus indica). The species has "a spectacular heartwood with background colors of ivory, yellow and black lines, which gives an unpredictable landscape effect. Much of the wood comes from logs that were found on the forest floor. It turns and finishes well. Due to the nature of the species, bug and worm holes may be present on some blanks, and no two are alike." 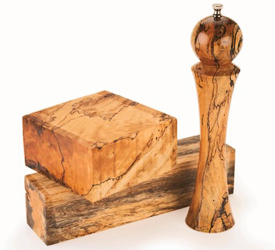 This spalted tamarind is native to Laos, and the company recommends taking precautions when working with spalted wood, such as using adequate dust-collection equipment and wearing a personal respirator or mask. 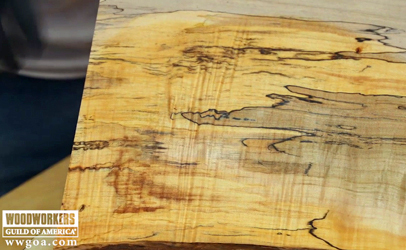 No two pieces are alike to start with, while the same wood growing in different locales can vary greatly even though it is the exact same species. Available are a number of sizes of turning blanks and some 3/4" boards for general woodworking. 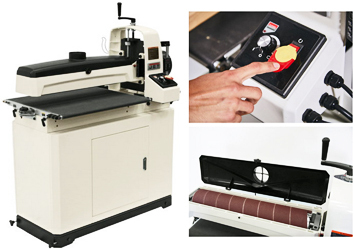 The new JWDS-2550 Drum Sander from JET is an open-ended, single grit sander with a 1.75 horsepower (15 Amp, 115 V household current) motor and an innovative, tool-less, parallelism system that keeps adjustments simple. The worktable is easily positioned by a turn of the parallelism dial. A variable-speed dial (top right in photo) permits you to choose the optimal feed rate for various materials and widths. The dial goes from 0 to 10, and the Sandsmart™ feature continuously monitors the load on the drum motor to prevent an overload situation. The mirrored design of the 4" dust hood centers and optimizes dust collection. Capacities are 4" thick and 50" wide on two passes (the second pass is reversed). The drum is 5" in diameter, and runs at 1720 RPM. JET says that "snipe is virtually eliminated thanks to the adjustable tension rollers that apply downward pressure to the workpiece". Cuts on the miter saw should be a little safer for your fingers with the Miter Saw Safety Stick from Florida based Infinity Tools (item 100-344). It's essentially a plastic hold-down device that holds parts on the saw table, keeping fingers away from the blade. 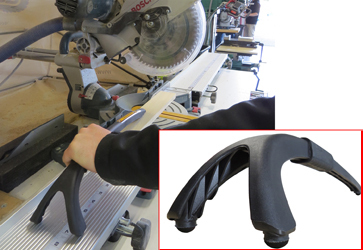 The company says that "the ergonomic design and slip-free grip helps to keep your hands away from the saw blade when working with small pieces. The unique wishbone shape and rubberized traction feet provides three points of contact to firmly hold the piece you are cutting. This is a must-have item when working with small cuts." It's a simple yet clever idea. The footprint is roughly 18" X 4", and the price on the website is $15.90. Infinity offers a wide range of router bits, saw blades, woodworking tools and accessories. One of the biggest changes in cabinetmaking over the last decade has been the emergence of outsourcing suppliers - large shops that supply doors, drawers and ready-to-assemble cabinets to smaller shops around the country. The emergence of this option has allowed a lot of smaller shops to stay in business by letting these suppliers do a lot of the heavy lifting while the local cabinetmaker adds custom accents and installation. A leader in the industry, Elias Woodwork has used its geographical location halfway across the U.S./Canada border to make shipping both timely and affordable. 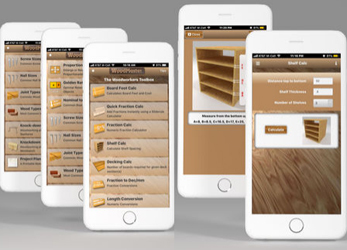 This month, the company has officially launched its new Access Now online ordering program, where woodshops can get quotes and place orders anytime, from anywhere. 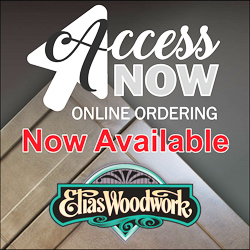 Access Now is an online portal that gives Elias customers insider access to their accounts, estimates, shipment tracking, product details and pricing. There's a short YouTube video that describes the process and answers most questions. 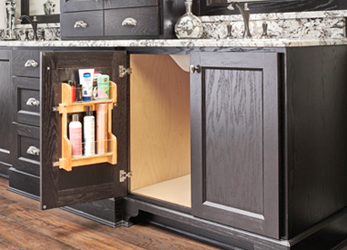 An economical new addition from Rev-A-Shelf lets woodshops add a handy option to bathroom base and vanity cabinets. Priced from $67.40 to $95.25, the three models in the new 4VR series will conveniently store toiletries on the back of a door, adding storage in a previously unused space. The small racks come in nominal 12", 15" and 24" units and each features a maple frame with a semi-gloss finish, two non-skid vinyl shelves with acrylic accents, and the company's patented adjustable mounting brackets. 4VR units are Carb II compliant, weigh in at 3 lbs, are 3-1/8" deep and 15-1/2" tall. The adjustable width ranges are 8-3/16" to 12-11/16" (4VR-12-1); 11-3/16" to 15-11/16" (4VR-15-1); and 20-3/16" to 24-11/16" (4VR-24-1). Woodworkers can view the current Rev-A-Shelf catalog online. 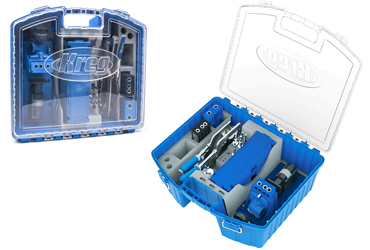 Woodworkers who own the Kreg joinery system can now pack all the parts in a varry case and take it to the jobsite, or store the system in a tidy way. The company's new System Organizer is the perfect place to store and organize all of your Kreg Joinery system parts - your Kreg Jig®, clamps, screws, drill and driver bits, and more. A portion of the Organizer's tray can be removed for storage of other items such as the Kreg Shelf Pin Jig, compact drills and drivers, up to six 500-count screw containers, or additional clamps. A transparent lid makes things easier to spot inside, to make sure you're bringing what you need. It's made from impact-resistant polymer and measures 18" x 15-1/4", by 6-5/8" deep. If you visit the site, note that one negative review has skewed the ratings while the rest are positive (one 5-star, two 4s and a 3). A small, one-man woodshop might use about 1,000 kWh of electricity a month, while a large one can use many times that. The average cost of a kWh runs between about 10 cents in Louisiana or Arkansas to more than 20 cents in Massachusetts and Connecticut. A big chunk of that usage is dust collectors. They draw a lot, and they run a lot. Ecogate blast gates were installed recently in the Auditoria Services shop, which builds cinema seating in the U.K. The new set-up, with intelligent blast gates, is saving more than half the 93,000 kWh that the facility was consuming. 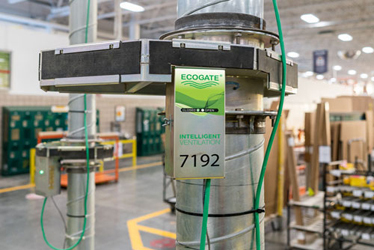 Ecogate says that "fan power increases with the cube of the air volume moved by the fan, reducing real-time air volume by 30% and reducing the system's electricity use by about 66%." Its gates measure and report air velocity, pressure, and air volume in real-time. Woodworkers who use angle or die grinders to finess metal or countertop materials, especially on the jobsite, will welcome a new family of cordless grinders from Fein. The German company, with U.S. headquarters in Pittsburg, has been making electric tools since 1867. In fact, Emil Fein invented the world's first electric hand drill in 1895. 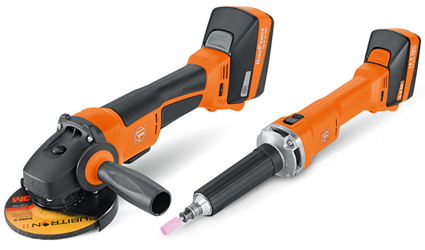 Among the new tools are four cordless angle grinders and three die grinders. They are dust resistant and powerful, along with being light enough to work all day. Along with built-in LED lights, some also have a dead man switch. The company's SafetyCell technology protects the battery and the tool from overloading, overheating and deep discharge. They come with warranties on both tool and battery. 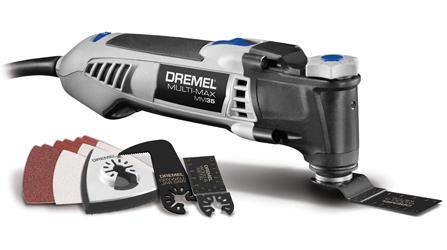 Dremel's new oscillating tool, the Multi-Max MM35, has tool-less accessory changes, a more powerful motor, and a wide 3.2 degree oscillation angle. Turning the knob on top of the tool and pressing it down releases the clamping flange to insert the accessory. And tightening the knob secures the accessory in place. The separate on/off switch lets users maintain a previously selected speed setting upon restarting the tool after it has been turned off. A soft-start feature minimizes abrupt starts and provides a feeling of control as the tool ramps up to the desired speed, while electronic feedback maintains consistent speed. The Multi-Max has a wide variable speed range from 10,000 to 21,000 oscillations per minute (OPM) and a powerful 3.5 amp motor. MSRP is $99.99 USD. Register Now for AWFS and Save! If you're still thinking about going to AWFS 2019 in Las Vegas, the Fair has just sweetened the deal for you. Register now with five or more people, and you can save 50%. The event will feature North America's largest gathering of woodworking equipment and technology, as well as the largest selection of hardware, tooling, components, power tools, manufacturing software, lumber, panel and construction material - as well as an endless array of supplies for furniture, cabinet, millwork manufacturers and custom woodworking shops of all sizes. It's more than a four-day event... it's an experience you can’t afford to miss. It provides exclusive access to the innovations, people, processes and ideas that are shaping the future of woodworking and technology. You can build connections, shop, exchange ideas - and explore the largest concentration of machinery, tools, supplies, education and technology available in today’s industry marketplace. Jobsite cleanup just got a whole lot easier. 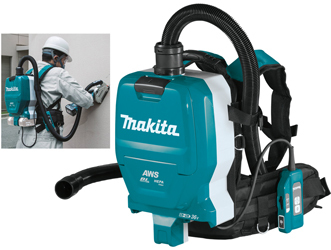 Makita's new HEPA filter Backpack Dry Vacuum (model XCV10ZX) is a 1/2-gallon extremely portable vac that runs on two 18-Volt batteries. Beyond eliminating extension cords, it bridges the gap between low-capacity on-board dust extraction systems and larger capacity but less portable wheeled canister jobsite vacuums. It can be used for general clean-up after an install, or during construction applications when used as part of a dust extraction system (various tool connecting adapters are sold separately). It includes three tool adapters for hose connection to most Makita dust extraction attachments. Powered by two 18V Lithium-Ion batteries (sold separately) for 36V power, the brushless motor delivers an efficient 64 CFM of suction and 44" of static water lift. The entire tool, with batteries, only weighs ten pounds. It's unusual to see a new 12 Volt tool in this age of monster batteries, but here it's quite appropriate. Introduced a few months ago, this is a small power plane that can be toted all day without making you tired. 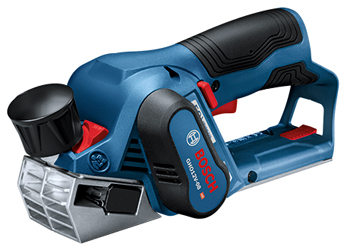 The Bosch GHO12V-08N 12 V Max Planer is about the same size as a hand plane, and it has a 2-1/5" path and a single-pass depth to a maximum of 8/100". It features an efficient EC brushless motor and when planing at half its max depth in hardwood, it delivers up to 33 feet per battery Amp hour (Ah). It is designed to provide the easiest planing experience for fast stock removal and smooth finishes. It is ideal for trimming doors because it is cordless, eliminating the possibility of running out of cord in the middle of a planing pass. This is a bare-tool kit at a street price of $179; the battery and charger are sold separately. Ryobi's new 18-Volt ONE+ cordless brushless jig saw (model P524, available at The Home Depot) was designed to provide a lot of run time, speed, power and long motor life. When paired with LITHIUM+™ HP batteries, it will deliver up to 3,350 strokes per minute on one battery charge. It has a cast aluminum no-mar shoe, a sight-line blower and an LED work light. It features a variable speed dial, clever and simple blade changes (it uses standard T-Shank jig saw blades, and comes with one), and the keyless bevel base adjusts from 0° to 45° right or left. 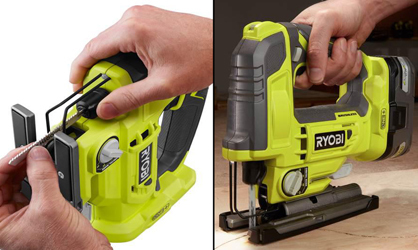 There's a lock-on trigger, four orbits for various cutting speed/action combinations, and on-board blade storage which can be quite handy on a jobsite. It's backed by a 3-year warranty. Woodcraft customers will be seeing more products branded WoodRiver® Dust Connection™ as the national woodworking equipment retailer emphasizes the range and compatibility of its dust-collection product line. It is also introducing new products such as the WoodRiver Shop Vacuum 12" Hose Kit that includes two tools and connecting hose plus fittings. The clear flexible hose is shown at right. It's reinforced with a black poly helix, making it crush resistant, and woodworkers will be able to see any blockages. Woodcraft customers will also notice new Dust Connection packaging and signage. If you own a Barracuda chuck, take a look at the side of it and see if the numbers match those in the photo at left. 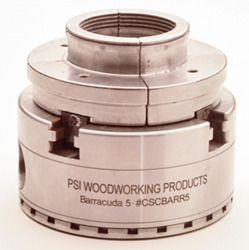 On December 11th, Penn State Industries recalled model CSCBARR5 quick change jaw chuck systems that are used to hold work on a lathe. The jaws can loosen from the chuck and break off, posing a laceration hazard. Wood turners should immediately stop using the system and contact Penn State Industries (see below) to receive a full refund of the purchase price. The company has received seven reports of the jaw loosening or ejecting from the chuck (luckily, so far no injuries have been reported). About 1,000 units were sold between March 2017 and August 2018. It was manufactured in China by Industrial Supply Ltd. If you purchased this system, call the company at 800-377-7297 between 9 AM and 5PM Eastern time Monday through Friday, or send an e-mail to the recall desk. Customers can also visit the PSI website and click on Product Recalls at the bottom of the page for more information. The Bora Tool QuickCut circular saw guide has been awarded a 2018 Pro Tool Innovation Award. The panel of judges is made up of tool and media professionals from across the United States and Canada. 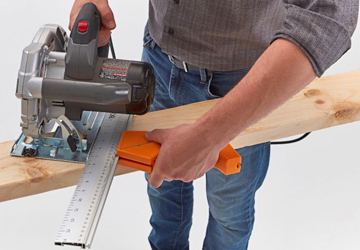 Introduced earlier this year, the QuickCut is an all-in-one tool designed to make perfect crosscuts and common miter cuts without a miter saw. It comes with a guide rail to mark long, straight lines, and use as a saw guide. For the award, hundreds of power tools, hand tools, fasteners, and accessories were judged, and winners had to demonstrate achievement in any combination of the following: innovative features, advanced power delivery, groundbreaking ergonomics, technological advancements, and value. 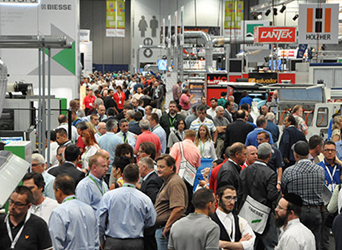 More than sixty tool manufacturers submitted nearly 300 tool entries in dozens of categories. Here's a video on the tool. The latest version (1.7) of the woodworking app Woodmaster can now calculate the number of deck boards required for a given deck section. Up to three deck sections are supported, and the calculations are based on 5-1/2" wide boards. The app ($7.99, developed by John Lullie, 10.5 mB) has calculators for board feet (with a tally count), shelves, fractions, fraction to decimel conversion, proportions (to enlarge or reduce scales), Golden Rule, nominal to actual size, plus screw and nail sizes. It also has a visual reference for joinery, and a visual wood guide. There are plans for a knockdown sawhorse and workbench, and a printable blank project planning form (handy for materials lists and cost estimates - not an interactive tool). Woodmaster requires iOS 8.0 or later and is compatible with iPhone, iPad and iPod touch. Cohen Architectural Woodworking in St. James, Missouri has received the Award of Excellence from the Architectural Woodwork Institute (AWI) for its work with the Cambridge Tower A at the University of Kansas Health System. This is the premier honor for companies in the millwork and custom woodworking industry. It is the sixth time that AWI has honored Cohen for woodworking excellence. The tower is an 11 story building with approximately 500,000 square feet. It houses 220 private patient bedrooms, a floor of surgical suites and a floor of diagnostic imaging. 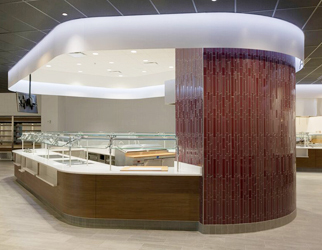 Cohen supplied the woodworking and fabrication for the facility, and architectural design was by Cannon Design in St. Louis. The majority of the cabinetry is a walnut laminate to provide warmth to patient areas, while giving a modern look. Cohen is a family-owned architectural woodworking firm. Tired of having to use two hands when driving screws - one to hold the drill and the other to hold the screw? The new driver heads from Micaton are rubberized, magnetic screw holders that make those kinds of tasks much easier, and even one-handed. A powerful neodymium magnet inside each driver head holds screws securely in place, which frees up your hand. The magnets are even strong enough to attract screws out of your tool box or bag, too. 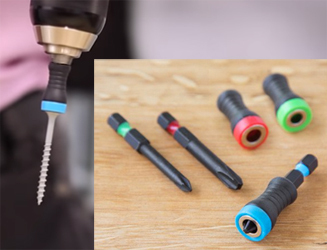 The heads (color coded by size) fit in power drill chucks or manual screwdrivers, and Micaton offers sets of 6, 10, or 18 pieces. The 18-piece kit also has a magnetic nail-holder that grips nails while you hammer. These small-but-smart solutions are easy to keep handy and are available from The Grommet's online store, where you'll also find a video. The kits run from $16.95 to $54.95. Next time you're at The Home Depot, have a look at the versatile jobsite system called Scaffoldbench. It's exactly that - a scaffold that can reach up to 12 feet high and handle up to 1,100 pounds, plus a safe, secure storage unit for the garage. It's also a utility cart that can move tools and materials from the truck to the jobsite, and a workbench on wheels. Plus, it can easily be turned into a miter saw bench with rails that will hold your miter saw or table saw. Metaltech's new Scaffoldbench is "the only product of its kind on the market today". It is an innovative multiple-purpose four-in-one unit with many uses on the job site and in the home garage. 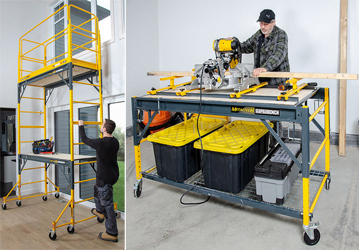 It is a six-foot wide by about 30" deep Baker scaffold (stackable up to three units), a storage unit, a utility cart with 5" heavy duty double-locking casters, and a mobile workbench with a miter saw stand. Units start at $325. Rockler Woodworking and Hardware has created a turning kit that lets turners craft a custom, single-cigar humidor. The user can regulate the humidity inside the chamber, to preserve the cigar's freshness and flavor and it fits cigar sizes up to a Churchill. There's a hygrometer with a dial, and if more moisture is needed the user can add a drop or two of cigar humidifier solution or distilled water to a foam disk in the bottom cap. The cigar rests on a platform above the foam disk to keep it from absorbing too much moisture. The kit requires a turning blank measuring at least 2" by 2" by 6" long. Users cut the blank in two and drill 1-1/16" holes down the center of each piece. The kit's aluminum tubes are epoxied to the inside of the blank sections, much as brass tubes from a pen kit are glued inside the sections of a pen blank. 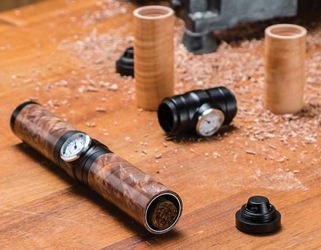 A set of bushings sized to the final diameter of the humidor is available for purchase separately, so it can be turned on a standard pen mandrel. 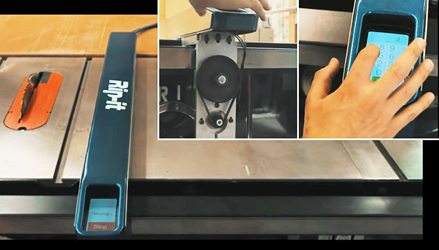 Rip-It is a fully automated tablesaw fence for small professional woodshops and serious hobbyists. It comes with a touch screen display, auto calibration (it moves by itself) and autolocking features, so it's ideal for shops that need repeatability for casework, drawers and so on. The Rip-it fence will be launched in early 2019 through a crowdfunder on Indiegogo.com. This is automation for the rest of us - just use the touchscreen to program it and put your tape measure away. The inventor is working on physical and software re-design at the moment, and some slight re-engineering. He has partnered with some big names including Arrow Electronics. Michigan based Bora Tool has released several new products over the past few weeks including the Portable Conveyor Roller (PM-2700) shown here, which is an expandable rolling system used for infeed, outfeed, moving, packing and loading. Also just announced is an expanded line of professional grade, pistol grip clamps, spring clamps, and lever clamps, including the heavy-duty parallel clamps shown. The company's Affinity Tool Works division is the exclusive North American distributor for FISCH, Tormek and Sjobergs. 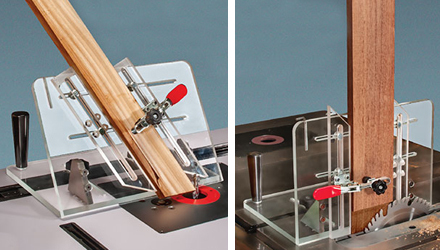 MLCS Woodworking has introduced a clear acrylic jig for the table saw or router table that makes it safer to cut tenons and custom profiles in the vertical position. The Vertex™ Multi-Angle Sled fits most of these machines' miter slots. 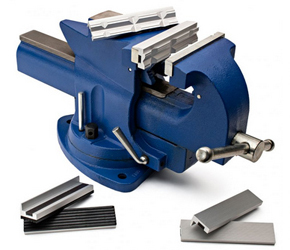 The sled face can be set at 45°, 60°, 75°, and 90° angles, and its precision miter bar allows for controlled movements. This jig helps cut tenons, slots, custom moldings and end grain profiles. One can safely work with stock in vertical positions, and it's easy to use and set up. Therre's a large size to make it easier to hold and process larger parts. Both the face and base measure 14" wide x 10" high. 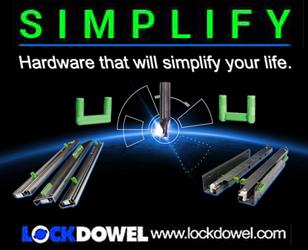 The vertical fences are 90° on one end and 45° on the other, and the toggle clamp can be used on stock up to 1" thick. Garrett Wade says that its new, beautifully machined 5" vise comes with 'superb supplementary jaws that will revolutionize what you can do'. It can rotate 360 degrees on its swivel base, has a maximum clamping capacity of 7-1/4", and weighs a heavy-duty 39 lbs. The supplementary jaws are made of nicely finished machined aluminum, with fitted magnetic inserts on the backs so they stay in place. The set contains three different pairs of Jaws, for three gripping surfaces. There's a non-marring, smooth aluminum pair, a machined pair with grooves that securely grip pipe and other round objects on either axis, and a rubber-faced pair that provides for softer gripping on delicate wood parts. It lists for $210 (item 18B02.10), and because of its weight there's a ground shipping surcharge of $15. Air shipping is not available. Garrett Wade is located in Cincinnati, Ohio. In 2007, the doors closed on the 151-year-old toolworks of the Auriou family. 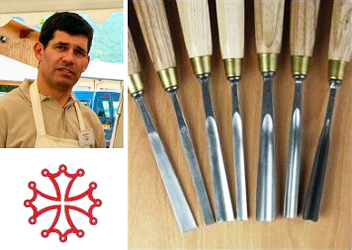 A new enterprise arose from the ashes at the Forge de Saint Juery, and now fourth generation rasp and tool maker Michel Auriou has introduced what are among the finest carving tools available. Endorsed and co-designed by master carver Chris Pye, their average overall tool length is 9-1/2" and Highland Woodworking is already offering three straight gouges (#3,6 and 9), six Allongee gouges (#3,6 and 9 in both 1/2" and 25/32"), a 3/8" V-tool and a 3/8" straight skew. In a unique process, their blades are forged by beating out a blank of steel to length before hammering the cross-section profile. This creates a very resilient grain structure in the metal which, when hardened to Rockwell 58C, underpins their superior edge-holding properties. In a new free video from the Woodworkers Guild of America, instructor George Vondriska explains the remarkable qualities of the figure feature chatoyance - the name comes from a French root meaning "shine like a cat's eye", and it has the same visual effect as the semi-precious gemstone Tiger's Eye. Although chatoyance initially might appear as though there is a defect in the surface, its quilted lines are absolutely flush with the surface, and deliver a three-dimension, shimmering effect. The Guild has a number of free vidoes online, and also offers classes and plans, member only discounts, a library of project ideas, ask the experts section and hundreds of woodworking articles. There are two membership levels - Premium ($6 a month, or $40 a year) and Gold ($104 a year).